I'm now in Atlanta, catching up from jetlag and preparing for what I expect is going to be a landmark event for WebRTC - probably the year's largest conference and exhibition on the technology, with rumours of 600+ attendees and a sold-out roster of sponsors. I'm speaking this afternoon at the Business workshop along with organiser Phil Edholm, and fellow analysts Chris Vitek and Brent Kelly. I'm also moderating four panels over the next few days, on topics like SIP/WebRTC coexistence, WebRTC "game-changers" & the impact on telco business models. I'll also be on the wrap-up panel on Thursday, "beyond the call". Add to that being a judge for 50 or so 10-minute demos, numerous client meetings, briefings and dinners, and I think by the end of the week I'll be saturated in the current status of the WebRTC marketplace. I've got a number of questions to answer, that I'll be looking for input for both directly and indirectly. It's often telling to see what people don't say, who is/isn't present, and meta-themes emerging when comparing multiple presetations or panel responses that gives a real clue. 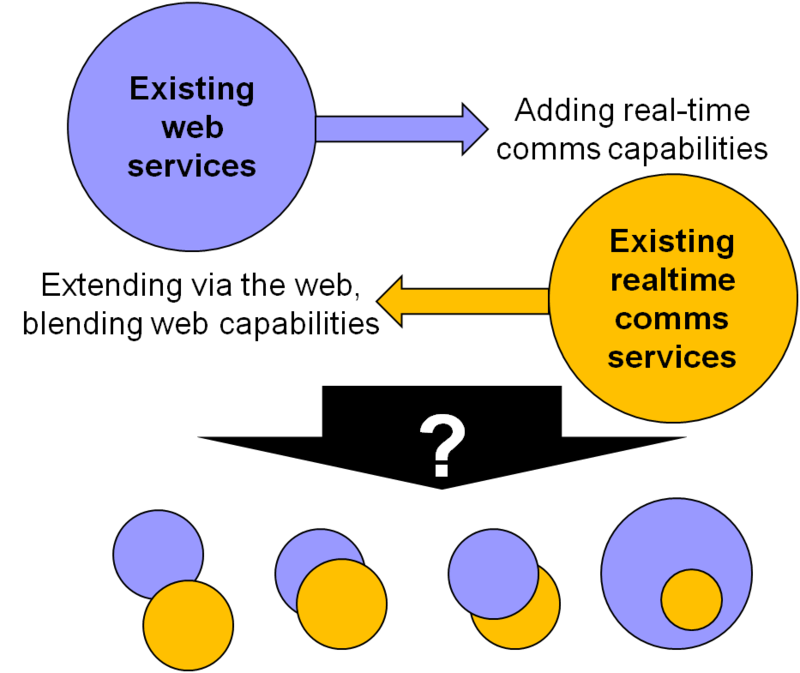 At the moment, I think enterprise use-cases have a narrow real-world lead over both consumer web & telco applications of WebRTC. Will that be sustained? Is the datachannel aspect of WebRTC really the hidden gem? How can I categorise and segment the WebRTC Gateway vendor space? Who's real and who's just playing Powerpoint-and-press-release? It's getting really competitive, and I suspect it'll end up as a few big players, plus niche focused specialists, plus a lot of "WebRTC-as-tickbox-feature". And some dead me-toos. How can I categorise the API/SDK/cloud bit of WebRTC vendor-land? I've lost count of the number I've encountered here - between 10-15 I think. Is it all about mobile? Is anyone doing anything *real* with WebRTC cloud platforms yet, or will it take developers a few more months to churn out the good stuff? Any news on the "missing"? Microsoft, Apple, IBM, Samsung, Amazon - please stand up! Bonus points for anyone doing a WebRTC mashup with face-recognition camera & LinkedIn profiles to spot any stealthy undercover representatives. Which telcos are lurking around? Who's willing to actually pipe up and say something beyond the usual culprits like AT&T & Telefonica/Tokbox? Where is Google taking all this? What can be inferred from what's left unsaid? How much of the WebRTC vendor market will Open Source eat? What are the appropriate WebRTC market metrics for me to forecast in the future? Are my forecasts for devices support & user base growth too aggressive, or will I need to upgrade them again as I'm actually conservative? Will there be any seriously big unexpected announcements? Plus also a couple of other topics I'm keeping under wraps, either for clients or my own research into WebRTC. Overall, it's going to be a gruelling week, but by the end of it I expect to have got a much better "world view" of where WebRTC is, and where it's likely to be be by the end of 2013 and beyond. Feel free to come and say hello and/or chat over coffee or beer - and apologies if I'm dashing around like a lunatic for my next session. On that topic: if you buy a licence for my WebRTC report before July 1st, I'll throw in the Q2 update I published a couple of weeks ago. And if you stump for an enterprise licence or a subscription to the updates (contact me for details), and I'll also add a 1-hour conference call to update on my thoughts from this week's show. I've been speaking to assorted vendors recently about their plans for carrier WiFi, linked to the usual rhetoric about Hotspot 2.0, ANDSF, so-called "seamless" authentication and so forth. I still contend that a lot of this is nonsense - the mobile operators are only one group in an increasingly complex ecosystem of stakeholders interested in WiFi. The end-users, venue-owners, tenants, fixed/cable ISPs, device vendors, OS suppliers, content players, app providers, employers, advertisers and local government all have "skin in the game" with helping users connect to WiFi. Mobile operators are not "special flowers" among that group - and certainly have no likelihood of enforcing their will about when and where users will connect; much less charge them or subject them to onerous policy controls. But I'm starting to spot a subtle distinction: indoor vs. outdoor use. In an indoor environment, users are used to WiFi being provided by their hotel, cafe, airport, home, office or other sponsor. Increasingly it is free, but perhaps with a small "hoop" to jump through such as watching an advert, or asking a barista for a code. Usually, the access point and backhaul are controlled by the venue or tenant, although a 3rd-party like a wireless ISP might be contracted to provide these. There will be an expectation that any person in that venue - irrespective of which cellular operator(s) they might use - will have access to WiFi, especially as many devices like PCs and tablets are WiFi-only anyway. This is very different from outdoors. Outdoors, people are properly "mobile", ie moving-about. They get access from only one provider - their cellular operator. Any other stakeholders like MVNO hosts, network-sharing consortia, site owners and so forth are hidden behind the "Operator X" logo displayed on the phone's screen. People accept and except that different operators will have different coverage, and that they do indeed expect "seamless" handoff from cell to cell. Outdoors, the HetNet vision makes more sense - macrocell, picocell, femtocell - and, yes, maybe WiFi - owned and operated by the telco, may be used to provide decent data connectivity, as well as telephony and SMS. While a few cities now have outdoor WiFi provided by a local council or company, that remains rare. People don't have expectations about outdoor WiFi behaviour the same way they do inside a building. A smartphone's WiFi essentially becomes a single-stakeholder environment (or two including the user) in the street, or perhaps a few special locations like aircraft. Indoor WiFi = multi-stakeholder, too complex for the 3GPP/WBA/OMA/GSMA model of operator control and network integration. Limited relevance of ANDSF, carrier-driven Hotspot 2.0, SIM authentication. Largely a UX problem. Outdoor WiFi = fewer stakeholders, more chance for direct integration & seamlessness. Although complexities where the user could access WiFi as well as 3G/4G metrocells & macrocells. Largely a RAN/policy problem. The other meta-problem comes from how to know when to switch from carrier-WiFi mode to multi-stakeholder WiFi mode as you enter or exit a venue. Linked to all this is a rather thorny issue of pricing and perceived value. For many years, the mobile industry has assumed that "nomadic" use of its network was a core part of its proposition, as well as when users are "truly mobile". While that might have been the case for telephony - an indoor mobile call is "worth" as much as an outdoor one - that no longer holds true for data. The assumption (increasingly, although varying by country) is that indoor data is free - provided as an amenity, equivalent to air-conditioning or lavatories. Carrier-provided indoor WiFi will be accepted by end-users as long as it is not charged against data plans, or subject too stricter policy controls than "native" WiFi. This is going to be as much a challenge for billing & charging systems as it is for the network. One of the things I'm expecting to hear a lot about at the upcoming Atlanta WebRTC conference & expo is partnering and the formation of vendor ecosystems. Most enterprises and telcos putting together WebRTC solutions – even simple ones such as extensions of VoIP or messaging, or basic customer-service apps – will be reliant on multiple vendors. To this end, we are starting to see the emergence of several “ecosystems” or groups of partnerships. Disruptive Analysis views this as a critical factor for vendor success in the near term. Over the next 3-6 months, expect to see many more similar alignments between complementary players, as well as further tactical acquisitions. Specialists such as Zingaya and Thrupoint are likely to carve important roles here, as well as a number of the API providers such as Twilio and AddLive. I think this will be especially important for the growing number of vendors providing WebRTC gateways to telco or enterprise infrastructure. On its own, a gateway is going to be rather useless. It will need to be blended into particular solutions, with specific feature-sets optimised for particular use cases. It will also need to be deployed with the end-user experience in mind, and the realities of mobile apps as well. This will mean design and client-side expertise, as well as testing, security and assorted other realms of software and consulting. Few vendors - if any - will be able to do all of this on their own. And as yet, we haven't really seen big system integrators wake up to WebRTC, although surely that is just a matter of time. What will be important in the very short term is the establishment of concrete partnerships and developer ecosystems - I think that will be a key determinant of which vendors emerge as actual commercial winners, versus those with standalone me-too products. I've just published the Q2 Update for the Disruptive Analysis WebRTC report, the first edition of which came out in February. That report was the first comprehensive study of the market for WebRTC, spanning telco, enterprise and consumer domains. Having covered WebRTC since Day 1 almost two years ago, my intention is to keep Disruptive Analysis in the position of leading analyst & consulting house in this sector. Firstly, I've upgraded most of my forecasts for both device support and expected active usage, as the original numbers looked a bit conservative in the light of recent developments. The speed of emergence of WebRTC in Firefox and Chrome-for-Android has been impressive, in particular. 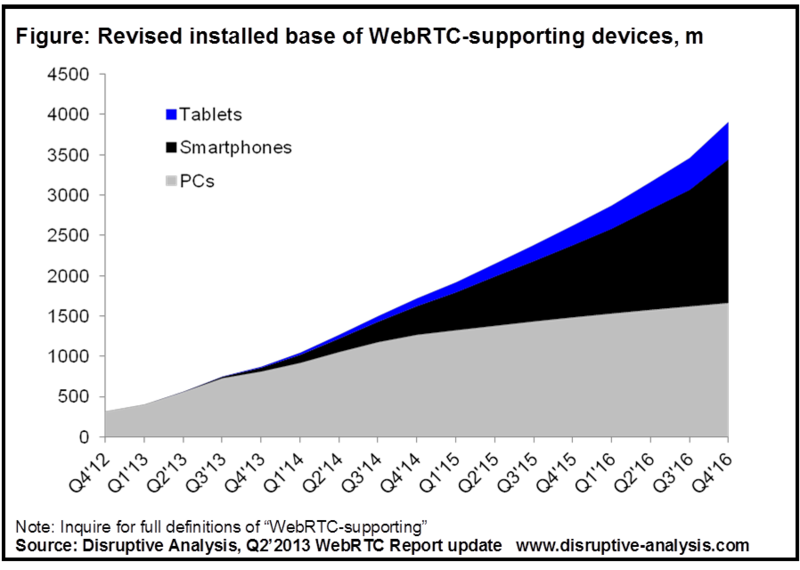 Also, overall smartphone growth is accelerating, while WebRTC support is being enabled by a growing range of API/cloud players as well, which aim to simplify the technology for mobile developers. Note that Disruptive Analysis' forecasts differ from some others in that estimation of primary browsers is a core step. Many users have multiple browsers installed on PCs or devices, but only use one regularly - a gating factor on realistic addressable WebRTC users for developers. The report update also includes discussion of the fast-evolving, already-crowded market for WebRTC gateways, and the need for vendors to look for differentiation based on specific use-cases or partnerships/ecosystems to stand out. In the last 3 months numerous vendors have announced products and strategies, some aimed at carriers, some at enterprises and others with general platforms. The market is already crowded, and the addition of various open-source alternatives as well as "WebRTC as a service" cloud platforms will make it even harder for generic me-too gateways to gain traction. In terms of strategic issues, there's an update on what Microsoft's intentions might be, as well as a viewpoint on the VP8 vs. H.264 impasse. My view is that MS is focused mainly on Lync/Skype/XBox integration as a strategic corporate opportunity, but will also start progressively adding support for WebRTC as it gets standardised - perhaps as well as its own CU-RTC-Web proposed alternate version. The video codec situation is messy and has no obvious near-term resolution. It's worth noting that two major H.264 advocates (Apple & Microsoft) are losing both credibility and moral authority with late provision of WebRTC-enabled browsers compared to Chrome and Firefox, which are helping define VP8 as the de facto video codec for web developers irrespective of the "official" standards work. This highlights the difference between "adding RTC to the Web" vs. "adding Web to RTC" - the former use cases and players move at web-speed, while the latter group tends to be constrained by the pace of traditional comms-business proceses (telco or enterprise). The document also looks at the current real-world use-cases (eg contact centre agents) and predicts the trends over the next 6-12 months. The proliferation of a startups in broad class of cloud/API-enablement players points to a coming rush of consumer-web applications for video-chat or integrated comms in H2'2013. Datachannels support in new browsers suggest innovation in domains like content-sharing and collaboration (including coding for developers). In addition, I'm expecting WebRTC-enabled adverts to be a major part of the future landscape. Telco use of WebRTC is bubbling under the surface - there's clearly a lot of interest, but I expect it to emerge relatively slowly because of the need for new "furniture" like BSS/OSS and testing solutions. Over-focus on standards will also cost telcos the lead, as I disussed in this recent post. And while IMS-integrated WebRTC is interesting, it is only one of 5 or 10 possible telco use-cases - operators' executives should ensure that numerous departments consider the opportunities for the technology, not just the core/voice network and labs teams which may be too slow and conservative. If necessary, telcos' innovation arms should be prepared to disintermediate their own voice/messaging teams and "BYOWebRTC" instead. The update also gives quick commentary on about 50 vendor/service players in the WebRTC marketplace, including the addition of 20-30 companies not mentioned in the original report. Is Israel about to ban carrier WiFi offload? I didn't see this coming at all - according to this article on Azi Ronen's blog, the Israeli government wants to ban carrier WiFi in public places, and has been consulting on this for some time, and will publish an official statement this week. I have to admit it's the first I've heard of it. "The reason for banning the use of Wi-Fi is spectrum shortage, and letting CSPs to use these frequencies will limit the public access to the internet. Nevertheless, municipalities and other public organizations will be allowed to offer free public Wi-Fi services"
The article Azi links to (put through Google Translate) suggests that Israel has allocated less spectrum to WiFi than most of the rest of the world and as a result there is a lot more contention for it. The two tables and notes on this Wikipedia page shows that the country does indeed block certain channels in both 2.4GHz and 5GHz bands. The article also hints that the Ministry would like to clear other chunks of spectrum to use for WiFi in future. Having been to Tel Aviv recently, it's worth commenting that there is free WiFi pretty much everywhere. Any restaurant or bar, as well as the airport, a lot of shopping malls and other public places, had free WiFi - either totally open or with a code provided for those who ask. While this might be a country-specific isolated law, it raises an interesting set of general issues and points. Firstly, it could be argued that Carrier WiFi offload is a less-valuable use of unlicenced spectrum than venue/app-sponsored free WiFi, because it doesn't add to the overall amount of (free) Internet Access available to citizens in public places. Instead, it just substitutes one form (3G/4G) for another (WiFi), with the benefit of "offload" accruing to the operator, rather than end-users or (implicitly) the economy. Yes, offload WiFi is often "free" or excluded from mobile broadband quotas to subscribers, but it is typically locked-out or fee-based for non-subscribers. Secondly it points out that WiFi used for (free) public Internet access is rapidly becoming a public amenity and that governments are starting to protect it. As well as various municipal WiFi projects provided by authorities themselves, we also have other legal rules on commercial provision of WiFi - for example Kuala Lumpur mandates that restaurants offer free WiFi. I also had a chat with a telecoms regulator a couple of years ago that mused that if WiFi use became sufficiently important and valuable, it might need laws to protect it - for example, against other uses of 2.4GHz such as leaky microwave ovens or garage door-openers. Increasing usage and popularity of WiFi points to the fact that a lot of smartphone/tablet use is "nomadic" rather than properly moving-about mobile - and therefore not really cellular operators' supposed target market anyway. Is "non-mobile" WiFi really a service? Or is it an amenity like air-conditioning and public bathrooms, or even electrical sockets in cafes? Thirdly, it points to a dilemma for telcos - if they start using WiFi and unlicenced spectrum aggressively, it becomes very hard - hypocritical even - for them to lobby against more spectrum being made licence-exempt in future. Obviously they would prefer to have licenced bands allocated to individual operators, but just without expensive auction fees. Fourth, this type of law is going to be quite hard to frame. Does it just ban carrier WiFi offload (ie actual substitution of 3G/4G traffic for WiFi) or does it also apply to all the other operator-led WiFi business models and purposes? 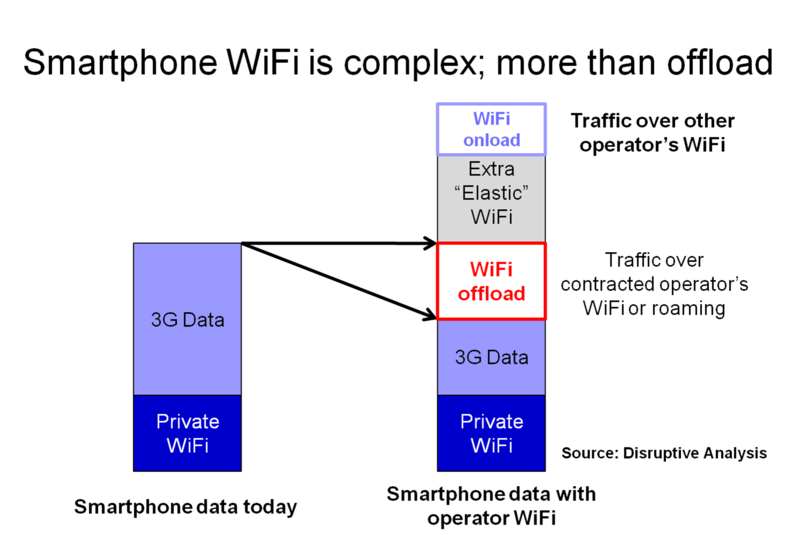 My view has long been that "offload" is probably only the 3rd or 4th most important thing that telcos can do with WiFi anyway - more interesting models are open-to-all "onload", managed WiFi for venues, wholesale WiFi for other service providers, "shared WiFi" models like FON, location analytics and so on. WhileWiFi offload itself doesn't improve public amenity of Internet access, some of the others generally go. Fifthly, there's always the outside chance of a "conspiracy theory" here - or at least some well-crafted game theory. If extra carrier WiFi in public places does congest unlicenced bands and interfere with other providers such as free hotspots in cafes, then implicitly it raises the utility and value of managed/licenced spectrum and mobile broadband plans. It would also make things like small cells much more attractive to end-users and venue owners. But surely nobody in the mobile industry would be that Machiavellian or cynical (or that smart) to do such a thing? Lastly, this throws into question the legality/acceptability of various "seamless" WiFi log-on technologies like ANDSF and Hotspot 2.0. As I wrote last week, I already think that these are problematic from an end-user point of view, but this adds a whole other angle. Overall, I'm a bit wary of this proposed legislation. While I certainly think that "seamless offload" and WiFi-integrated HetNets are problematic for all sorts of reasons, I'm definitely a supporter of what I'd call "WiFi Neutrality" - that users should be able to connect to whichever wireless ISP they wish and not be forced/blocked by external forces. I had telcos restricting "private" WiFi in mind, but this could equally apply to governments as well. (Employers and parents enforcing restrictions are OK for obvious reasons). I regularly use various forms of carrier WiFi - although in the UK this is usually provided by fixed rather than mobile operators. What would happen with hybrid fixed/cellular telcos, eg BT now has LTE spectrum - would Openzone be banned under the Israeli proposals, or just any use of it for offload? This is a complex area and while (as far as I can tell from a brief article) the Israeli government's intentions are sound, there is a lot of complexity in the details. I'm currently writing up the first of the quarterly updates for the report's subscribers. (What do you mean you haven't bought it yet? Sort it out....!) and one of the conundrums is that while standards are slower than I anticipated, uptake and various fields of innovation seem to be happening even faster than I'd envisaged. I'm upgrading my forecasts. Standardisation is slow both overall in terms of finalising the IETF/W3C drafts, and specifically with certain elements within them. I'm not going to rehash the video codec debate in this post, but that's still lurking. There's also a lot of to-ing and fro-ing in the email discussion lists about the "offer/answer" approach to setting up or tearing down WebRTC sessions, especially around large multi-party conferences, which may have to endure a lot of setup latency. Add in security, enterprise considerations, needs to support various telco use-cases and techniques like network QoS, and it's unsurprising that things are becoming more complicated. There are also a lot more stakeholders involved, many from "legacy" worlds of communications as well as the more free-wheeling web community. But ironically, one of the side-effects of slowed standards finalisation appears to be a disproportionate effect on the telecom and “conservative enterprise” segments for WebRTC. Those groups are typically the slowest and most constrained to wait for specifications to settle down before taking action on implementation. It seems unlikely that too many operators will want to release "live" WebRTC-extended VoLTE or RCS while the standards and implementations are in a state of flux. Conversely, web-based companies tend to be much happier with fluid pre-standard versions of APIs or capabilities. They either re-work code as new versions emerge, or rely on a host of intermediate API/cloud providers to do it for them. In the case of WebRTC, for example, there are already more than a dozen companies “wrapping” WebRTC video-chat in forms suitable for embedding into websites, providing developers with SDKs, libraries (chunks of pre-coded software downloaded with a page) and cloud back-ends. Numerous early applications and services are using VP8 implementations for video in Chrome or Firefox - irrespective of whether we end up with a defined standard or not. It is the tier of enabling cloud/API providers that will bear much of the pain of standard tweaks or eventual fragmentatation – but as experts focused on the changes, they are capable of doing that with alacrity. If anything, slowing down standards for WebRTC may only end up harming those most responsible for delaying them. For everyone else, there's already "enough to be getting on with". In my view, telcos and network equipment vendors need to try to *accelerate* the first round of WebRTC standards, as otherwise they'll get bogged down in layers of SIP-like extensions and regulatory "what-ifs". Save that stuff for 2.0. Separately, divisions of telcos that are not linked into the core-network/standards process should just "get on with it" and develop their own early WebRTC prototypes, sites, apps and products immediately - if necessary, disintermediating their own official "comms" platforms like IMS if they're not prepared to work on the basis of day & week cycles, rather than quarters and years.